"...Director Gary Griffin's emotional Chicago Shakespeare Theater revival of this iconic title (book by Arthur Laurents, music by Jule Styne and lyrics by Stephen Sondheim) is certainly the best "Gypsy" in Chicagoland for years (and I have seen many). Louise Pitre, its fearless and tireless star, may not have the piercingly clear pipes one usually associates with this role (and on Thursday night, her voice sounded a little battered), but Pitre's more weathered sound (which you might recall from "Mamma Mia") unifies Rose's numbers and the show's story of wearying persistence with uncommon intensity. Star turns in Chicago theater - especially at this Chicago theater - have sometimes resulted in disconnects, with isolated leads inhabiting a different landscape from the Chicago ensemble. Not here. Fueled by a formidable force of will and phenomenal technique, Pitre's performance is well-connected to every human being (and the odd live animal) she encounters on her journey into irrelevance, even though she resists that fate like a determined senior throwing off dementia." "...Director Gary Griffin's altogether enthralling Chicago Shakespeare Theatre production of the cJule Styne-Stephen Sondheim-Arthur Laurents Broadway classic makes all this clearer, more real and less shrill than in any of the countless versions of this show I've seen over the years. And with the astonishing Louise Pitre starring as Mama Rose - the original "tiger mom," and a human engine that cannot be shut down - he has tapped an actress capable of making the hunger to be noticed, and the relentless pursuit of a dream that hunger sets in motion, feel every bit as pitiable as cruel and destructive." "..."Madame Rose" Hovick, the lead character in this 1959 musical masterpiece, is one of the great roles in American drama-right up there with Blanche DuBois, Mary Tyrone, and Willy Loman-and Gary Griffin's superb stripped-down staging of the work rests squarely on the shoulders of Louise Pitre's fierce, flinty performance. As the desperate stage mother trying to groom her daughters for vaudeville stardom, Pitre is every bit the "pioneer woman without a frontier" Arthur Laurents's script calls for, and her gritty vocal texture and expressive phrasing bring out the nuances in Stephen Sondheim and Jule Styne's brilliant score." "...But despite how grand the show looks and sounds, a show like Gypsy is all about the star. And this Rose, while she has an intriguingly gritty, down-to-earth appeal, can’t quite muster the dynamic energy that defines her character and enraptures audiences." "...A role written for Ethel Merman, Rose is undeniably a powerhouse. Different actresses have of course found variations in the character over the years, but one thing is essential: Rose must be the play’s galvanic force. She has to be both the driver of the train and the boiler powering its engine. And as of opening night of the new revival at Chicago Shakespeare Theater, Louise Pitre ain’t got it." "...But all is not lost: there are some bright spots to celebrate. The 14 piece orchestra blasts the joint with brassy new arrangements (by music director Rick Fox), including a very well-played overture (though, the wailing trumpet solo has oddly been cut). Jessica Rush ranks among the top three Louise’s I’ve seen, and, despite Griffin’s clunky direction which isn’t helped by ChiShake’s thrust stage, she nails the tricky strip sequence, which requires an actress, in a span of less than 10 minutes, to show Louise’s rapid ascent from fumbling tomboy to the sparkling creation that is Gypsy Rose Lee. And, as is usually the case, the trio of “Gotta Have a Gimmick” strippers steal the show. Particularly Chicago favorite Barbara Robertson, who in just a few short scenes, offers up a Tessie Tura with more grit and drive than any other moment in this ultimately lackluster effort." "...Chicago Shakespeare Theater has given us a “Gypsy” for our own time, one that embraces the difference that 55 years have made since the brassy blockbuster first strutted onto the stage. As directed by Gary Griffin, it’s a gritty roadshow musical with a surprisingly contemporary and tender heart." "...As always, Griffin commands the finest in Chi-biz-Matt DeCaro as a backstage bully, John Reeger as Mama Rose's unsupportive dad, Marc Grapey as a cigar-smoking tyro. Then there are show-stopping, scene-stealing Barbara Robertson, Molly Callinan, and Rengin Altay as Tessie Tura, Mazeppa and Electra, the stripper specialists in "You Gotta Get a Gimmick." It's the ultimate tribute to Darwinian adaptation, the secret of showbiz survival and even success. Who needs Galapago finches, snails or turtles? Get a horn!" 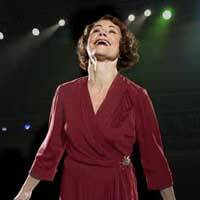 "...Gary Griffin's production of GYPSY is flawless, fast-faced, well acted and superbly sung and danced. Who could ask for anything more? GYPSY is a classic back stage story of vaudeville and of a mother's living her life and her dreams through her children. It is also about the rise of Gypsy Rose Lee, the famed stripper. This production is honest, emotional and empathetic. Louise Pitre sure has made Mama Rose hers. What an amazing performance! it begs to be seen. This GYPSY is one of 2014′s best shows." "...Rick Fox’s musical direction is excellent, and the orchestra is lush, although not always perfectly synched with Rose far below. Ray Nardelli and Dan Mead’s Sound Design is good. Kevin Depinet’s set promises a unique take on CS’s unique thrust but I wished the decorative fly spaces were utlitized, and the curtains used in a way that surprised me. Phillip Rosenberg’s lights were fine. But none of the designers delivered the ‘wow’ factor that I was craving for in the final sequences." "...If you only have one BIG musical to see this year, let it be this one. You will, no matter how many times you may have seen it before, find yourself seeing it in a new light. Part of that is Griffin and the rest of that is the talent on the stage. As I always say, the ensemble can make or break a show and this ensemble of players MAKES this production in all caps!" "...Rose claims that she’s not going to die from sitting, but from getting up and getting out. Once they hear about this fabulous production, audiences will be following her example by getting up and out to Navy Pier in order to experience Gary Griffin’s never-to-be-forgotten production. This a show that keeps its musical promise to Entertain You and Make You Smile." "...GYPSY definitely knew how to entertain me. It certainly made me smile. I saw some old tricks and some new tricks. I found it very versatile. And I did have a really good time."